Peter Fagan, creator of those delightful Colour Box series of figures, depicted his cats, bears and other creatures in all kinds of situations – including holiday scenes. The Colour Box characters enjoyed a holiday just as much as we do – they knew there was nothing to beat sand beneath their paws, seaweed tangling their fur or saltwater damping their tails. 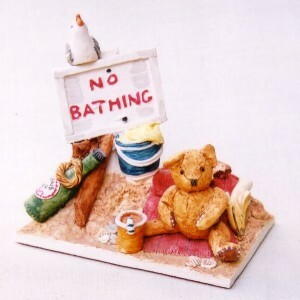 And through the talent of sculptor Peter Fagan we saw the cats, bears, and many other creatures, having fun on the beach. Much of the excitement of a holiday is the anticipation and the packing – at least, Robert seemed to think so. 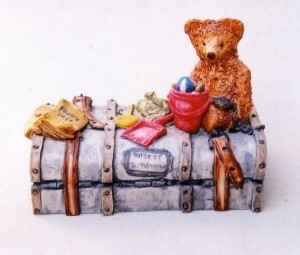 The super sculpture Holiday Bear (TC 210) issued in 1988, showed the little bear perched on top of a large blue trunk, obviously bound for a holiday destination. The trunk was beautifully modelled to show the straps, fastenings, and name label, and Robert had his own red bucket and spade, ball, bag of chips and lollipop. 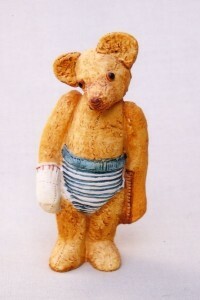 This was one of the larger pieces in the Teddy Bear Collection, as was Bathing Beach (TC113) 1990, which depicted Christopher sitting on a towel with his picnic lunch of a banana, orange drink and a sandwich close by. Nearby a notice warned ‘No Bathing’ (and in tiny letters underneath ‘by order of P Fagan’)! A seagull perched on top of the notice, while beneath was a collection of items including a bucket, spade, pebbles, shells, length of rope and a bottle of Fagan’s Pop. Amongst the bears you might possibly encounter at the seaside were Jimmy, Martin or Bosun. Jimmy (TC618) 1991, looked a rather shy bear, who, according to his booklet was ‘champion at building sandcastles. He lived in Bournemouth near the beach, where his family ran a fish and chip shop.’ Jimmy wore smart blue and white striped bathing trunks, and one white woolly mitten. Martin (TC121) issued 1993, was a smart Able Seaman bear, who carried a canvas kitbag and wore a sailor’s hat with ‘HMS Teddy’ around the brim. He was dressed in navy shorts and a white shirt decorated with a motif of a cruise liner. Bosun (TC074) 1997 was an unclothed bear, except for his official peaked hat. 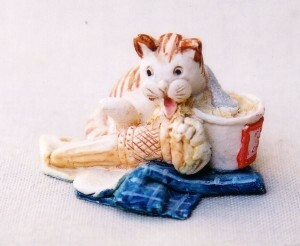 Cats don’t seem so keen on the seaside, but Beach Boy (HS536) 1991, showed a black cat on the sand with a sailboat-decorated red bucket and the beginnings of a sandcastle, while in the delightful Sixpenny Cornet (HS528), also 1991, we saw a cheeky ginger and white striped cat busily licking an ice cream cone while snuggling up to a tub of Fagan’s Dairy Ice Cream complete with a large silver spoon. 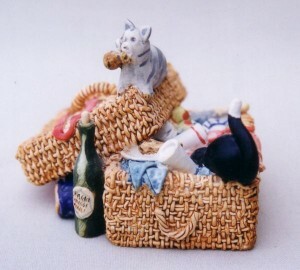 Picnic Puss, a Colour Box club special depicted those naughty cats stealing food from a picnic hamper, though whether it was on the beach or not, I couldn’t say! The dogs weren’t forgotten. Sea Dog (DG302) 1991, from the Personality Pups collection was a smashing sculpture of a very hairy brown and beige mutt perched on top of a red bollard. Ropes were entwined around the bollard, and the dog had an expectant look, which, according to the story booklet was because he was based on Peter’s boyhood dog who would jump on top of a bollard waiting to be fed batter from Peter’s fish and chips! Tethered to the bollard by a silver chain were two grey and black dogs, which could also be bought separately as Fatherly Love (DG205) 1991. Pennywhistle Lane collection featured a piece called Old Sea Salt (PL203) 1994 which showed Sam the pipe-smoking monkey dressed in beige trousers, dark red jacket, yellow-spotted blue scarf and jaunty blue hat standing on top of his old green sea trunk ‘full of past treasures’. Sitting on the end of the trunk was a cheeky little mouse wearing a sailor suit. The trunk was amazingly detailed, with all the brass studs, rivets, padlock and handles carefully accentuated in gold. Sam held a thick length of rope. The Hopscotch range included several tiny creatures you might find on your holiday, including a bright scarlet lobster (H106)), a beige crab (H105)), a plump orange fish (H104), and a cheeky blue clam peeking from its shell (H103), all issued in 1996. The Miniatures Collection also contained many animals and birds associated with the coast, for instance, Puffin (MC16) 1987, standing on a grey-green base. 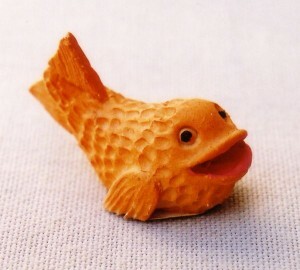 This model could also be found with a sand-yellow base. 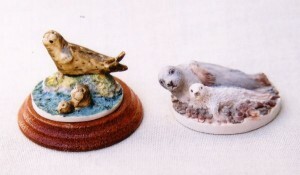 The Seal (MC49) 1989, and Seal and Pup (MC6) 1983, were both highly-detailed models, with the water, stones and rocks realistically depicted, as well as the creatures themselves, in tiny sculptures less than one-and-a-half inches high. If you were very lucky, you might just have caught a glimpse of a shimmering blue tail glinting in the sun, or perhaps noticed a friendly paw rise for a moment from the waves. Then you would have known that you had seen a Merbear (TC158) 1998, one of Colour Box’s prettiest-ever creations. Guardian of the Ocean, she cared for those who travel on her seas, as well as looking after the marine life. Many other sculptures from the Colour Box range featured holiday topics, including limited editions or club pieces such as Sail Away, All at Sea, Lifeguard and Out For a Run. Early Colour Box sculptures can often be found at collectors fairs, or on the net, and are worth collecting for their amazing detail and smile-making subjects.